Summary: I think there are conceptual similarities in the genesis of prime and irrational numbers that should be recalled for clarifying the meaning and functions of prime numbers, looking for the laws of their regularities and their appearance in the physical nature. I think that there is also a similarity between prime numbers and subatomic particles. If we identified a spatial segment with the number one, and thought about an infinite universe of 1 numbers, we would be imagining a perfectly symmetric universe that we would associate with the idea of proportion and – although its infinitude – rational measure. But if we think about limited spaces with different shapes and odd quantities, we can imagine asymmetries. I think there is some similarity on the origin of prime and irrational numbers. Greek people created irrational numbers like magnitudes when they found segments that resulted immeasurable using the segments they took as reference. They represented a broken between arithmetic and geometry. In the case of natural numbers we express longitudes too. And they can be symmetric or asymmetric because they represent quantities with respect to a spatial reference. By example, if we took as reference a segment that is the number 1, and we count at its right side the longitude of another segment 1 and we do the same at its left side, we will have a symmetric longitudinal space with respect to the central number one. If we were creating numbers for the first time on an one-dimensional infinite space that we knew symmetric and proportionated because it would be formed by infinite numbers 1, on each new magnitude that we called “number” we would tried to preserve the idea of symmetry. We could create the number “2” with two numbers 1 preserving symmetry. If we count one more number 1, we would preserve the symmetry because there would be a central number 1 and a right and a left numbers 1. We could express that new longitude with a number 1 and a number 2 too, but it would not preserve the symmetry. So, we would need to create a new magnitude that we would call number “3”. The number three is a prime number. It serves to solve the lack of proportion that would be evident if we used numbers 1 and 2, our preexisted magnitudes, for expressing that longitude. I consider that prime numbers are simply that. They are numbers that we use when we cannot preserve the symmetry with the existent previous numbers that we use as magnitudes for measuring spaces. On the picture above, the prime number 61 cannot be expressed in an integer way with any of the natural numbers that exist before it. This can be represented visually like a spatial asymmetry taken any integer number/point as reference. It will always exist more quantity of integer numbers in one side than in the other one. To solve this asymmetry we create a new magnitude, and we say the number 61 is a prime number, that is to say, we create a new number for referencing its magnitude in an integer way. And we say this a new number not formed by any other previous numbers (except the number 1). It is prime in the sense of “primary”. Number 62 is not prime because it can be formed with the pre existed integer numbers respecting symmetry and proportionality. One time that we know or we have remembered what prime numbers are, and looking for the moments that symmetry is broken when measuring the space new numbers are created, we could find out, I guess, their periodicity. I think that on previous posts I confused at times the spatial distribution of prime numbers and their periodicity; They are different things. But I think it could be possible to use geometry too for identifying easily prime numbers through their spatial location, when it comes to periodical spaces, in a similar way that I tried with the spiral formed following the atomic model that I defend. 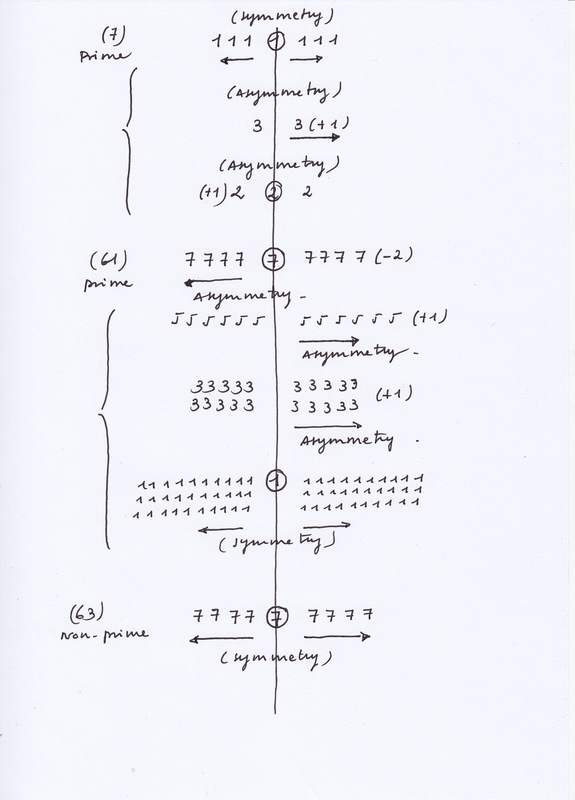 On my view there also a similarity between prime numbers and subatomic particles because of the broke of symmetry. My atomic model is non conventional. I think that fermions are the fields created in the intersection of two entangled (physically intersected) gravitational that vary periodically with opposite phases, when one contracts the other one expands. There is a lack of symmetry that determines that fermions are rule by the Pauli exclusion principle. 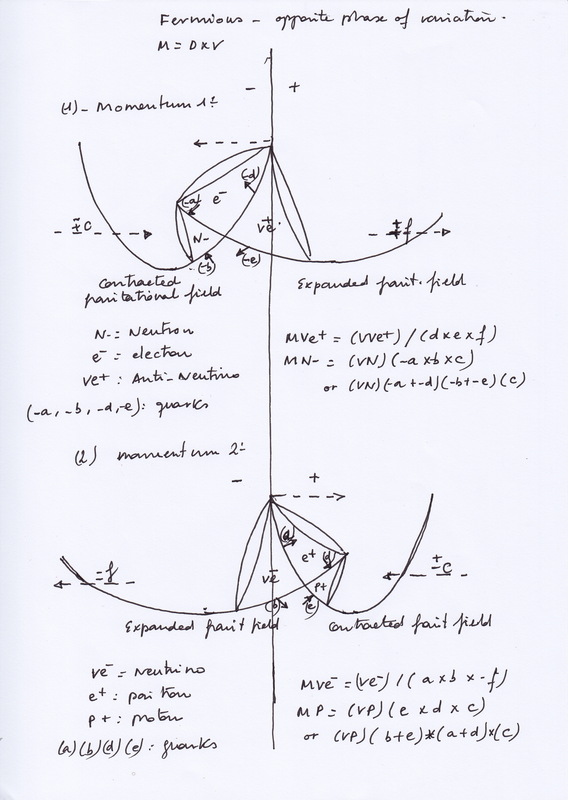 In the picture below you can see clearly how the electron field losses its symmetry when moves toward the side of the gravitational field that contracts. When it moves toward the left side it is considered an electron, and it is a positron when it moves toward the right side. Electromagnetic charges are simply spaces that move toward the left or right side creating pushing forces outside them and kinetic motions inside. In this model bosons are the four fields created in the intersection of at least two entangled (physically intersected) gravitational fields that vary periodically with the same phase, both contract (and later expand) at the same time. Bosons have symmetry at the horizontal plane but I consider they have a lack of symmetry at the vertical axis, where the Pauli exclusion principle acts too. 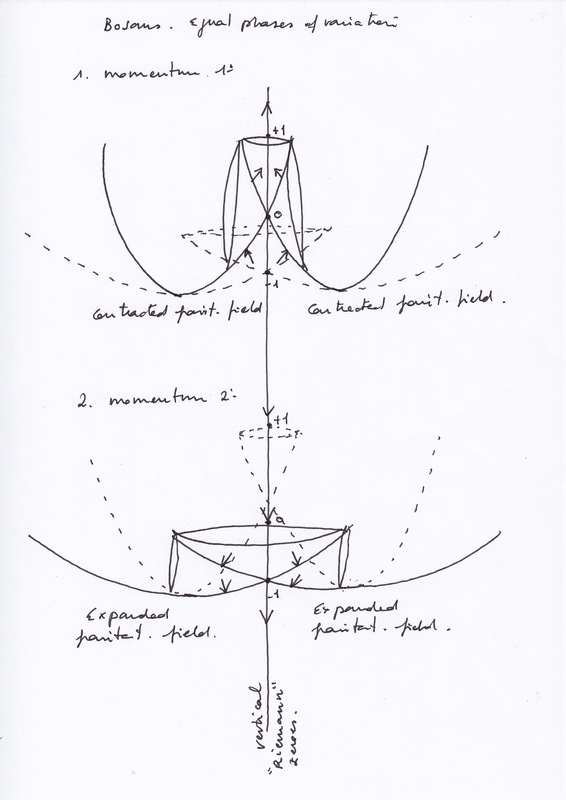 In the picture below you can see how the field that exist in the symmetric center of the figure moves upward when the two entangled gravitational fields contract, creating an ascending force of pressure that will create a photon. When those two gravitational fields expand there is a lack of pressure in the field that moves downward producing an energy decay. I think that the phases of variation of the entangled gravitational fields synchronize and desynchronize periodically and that fermions became bosons and bosons fermions periodically.